The state of today’s environment has become greatly affected by the amount of emissions and harmful substances coming from internal combustion engines. Such engines are used in the transportation industry as well as at stationary power plants. The progress in the field of engine building has recently served to reduce the amount of harmful discharges into the air. Despite the progrees, there is still large amounts of emissions and there is no complete solution to this problem. In general, the amount of harmful discharges is determined by a wide range of factors such as: (1) type of engine and its features; (2) nature of the engine’s operation and proper tuning for efficiency; and (3) the quality of fuel. When examining the list of substances that are emitted from the typical internal combustion engine, we learn that most of the subsances, except nitrogen, originally came from the fuel itself. In addition to the fuel as a source of emssion substances, a great amount of discharges are caused by solid foreign particles in oil products as well as high-molecular or sulfur-containig compounds that are in the colloidal state. When the amount of such substances exceeds normal limits, the oil will become dark. The decoloration of black oil is a desirable way to reduce the amount of harmful discharges. 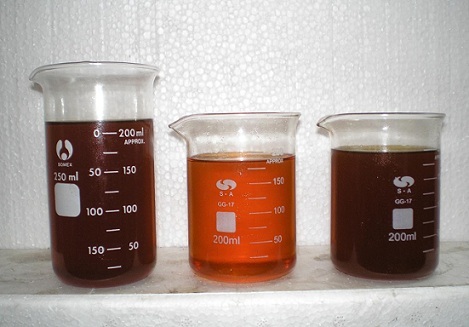 Filtration is often used to purify and decolorate oil products. The effectiveness of such processes largely depends on the material that is being filtered. The pore size must be sufficient to reduce pollution and contribute to the normal flow of the fuel. Due to the nature of the black oil, it has been difficult to find the optimal filter to perform such a difficult filtering task. For example, the filter paper brand BFM, has an average degree of filtration of 12 microns of fineness. It is therefore, unable to hold small solid particles and colloid impurities. On the other hand, filters made of such paper do not prevent the normal flow of fuel. The FOB brand of filtration paper however, has a higher degree of filtration, but creates larger resistance to the flow of fluid. Since there is no perfect way to completely and properly filter fuel as it flows to the engine’s fuel delivery system, it is better to clean and purify the fuel before it gets to the engine’s fuel tank. Filters can be used for the purification process, but they possess the same disadvantages listed above. It is therefore, more desirable to purify and decolor fuel by using special equipment such as the GlobeCore branded UVR line of purification equipment. The GlobeCore UVR line of units are used to remove mechanical impurities, as well as to regenerate and decolor not only the fuels, but also transformer oil, industrial oil, and turbine oils. The equipment in the UVR line contributes to the reduction of harmful discharges into the atmosphere as well as helping to reinstate the fuel product to a marketable condition. The mobile design of the GlobeCore brand of UVR units allows the user to process fuels, fluids, and oils not only in storage locations, but also at remote operating sites.